alaTest has collected and analyzed 221 reviews of Bosch Tassimo Joy TAS 4504. The average rating for this product is 4.6/5, compared to an average rating of 4.2/5 for other products in the same category for all reviews. Reviewers are impressed by the design and usability. The performance and size are also appreciated, whereas some have doubts about the durability and capacity. We analyzed user and expert ratings, product age and more factors. Compared to other products in the same category the Bosch Tassimo Joy TAS 4504 is awarded an overall alaScore™ of 87/100 = Very good quality. 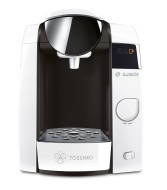 alaTest has collected and analyzed 109 user reviews of Bosch Tassimo Joy TAS 4504 from Amazon.co.uk. The average user rating for this product is 4.7/5, compared to an average user rating of 4.3/5 for other products in the same category on Amazon.co.uk. People really like the noise and performance. The price and maintenance also get good feedback, but comments are divided on the size. Some have doubts about the capacity. Took a while to set up as only pictures, no explanations! But after that it was all great- makes delicious coffee really easily and loads of flavours to choose from. Really good buy. Works really quick, makes a perfect Brew. This machine is a must buy for the perfect coffee machine, intellibrew is very clever, would recomend this on any Santa list. I bought this 2 weeks ago and its brilliant, easy to use and I am really pleased I bought the water filter version so much easier than messing around with a filter jug and it produces a lovely cup of my favourite coffee. Love it! Makes perfect cup every time, no fuss, no mess, just a delicious drink. Would recommend. I have had this about 2wks and so far so good. The only negative is that the instructions are not great. We had the light flashing and took ages to find out what we had done wrong. But sussed it now and getting great coffee.